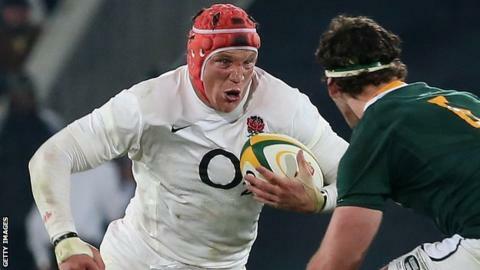 England flanker Tom Johnson has been ruled out of the Six Nations with a knee injury. The Exeter back-row is facing three months out, while London Irish prop Alex Corbisiero will miss at least the first two games following knee surgery. Gloucester fly-half Freddie Burns is set to miss the Scotland and Ireland matches because of a knee problem. And Leicester centre Manu Tuilagi is a doubt for the Calcutta Cup match with an ankle injury. However full-back Alex Goode, who impressed during the autumn series, is hoping to prove his fitness for Saracens in an LV= Cup match against Cardiff Blues on Sunday. England have already lost Northampton flanker Calum Clark for the whole of the Six Nations with a shoulder injury. Johnson, who was carried off during Exeter's Heineken Cup loss to Leinster, was not expected to feature in the match-day 23 against Scotland on 2 February, with captain Chris Robshaw and Tom Wood the likely starting flankers. But it removes another option from the back-row alternatives, with Tom Croft also unlikely to play any part until the middle of the campaign as he feels his way back from a neck injury. "Tom Johnson is probably facing a three-month recovery time. For him it is a tough blow," said head coach Stuart Lancaster, who had already brought uncapped Worcester flanker Matt Kvesic into the squad as cover. England's biggest concern is over Corbisiero, who has not played since the victory over New Zealand on 1 December. He was due to have his troublesome knee "cleaned out" on Wednesday. "His knee hasn't settled down," Lancaster explained. "It keeps swelling after small amounts of exercise. There is a loose body in there. He has gone in for a scope today to get that loose body taken out and hopefully that will settle down for him. "We will get him rehabbed and back playing for London Irish. That will take him out of the first two games as a minimum." Burns, who made such an impressive debut as a replacement against the All Blacks, will also have to put his Six Nations ambitions on hold for the time being, leaving the fly-half spot a straight choice between Owen Farrell and Toby Flood. "Freddie has had a scan on his MCL," Lancaster added. "It is a grade two injury so not as bad as first feared, but it will keep him out for two or three weeks. We will try to get him back as soon as we can." Forwards: Props: A Corbisiero (London Irish), D Cole (Leicester Tigers), J Marler (Harlequins), M Vunipola (Saracens), D Wilson (Bath Rugby); Hookers: D Hartley (Northampton Saints), T Youngs (Leicester Tigers); Locks: J Launchbury (London Wasps), C Lawes (Northampton Saints), G Parling (Leicester Tigers), M Botha (Saracens); Back-rows: T Croft (Leicester Tigers), J Haskell (London Wasps), T Johnson (Exeter Chiefs), B Morgan (Gloucester Rugby), C Robshaw (Harlequins), T Waldrom (Leicester Tigers), T Wood (Northampton Saints), M Kvesic (Worcester). Backs: Back three: C Ashton (Saracens), M Brown (Harlequins), B Foden (Northampton Saints), A Goode (Saracens), D Strettle (Saracens), U Monye (Harlequins); Centres: B Barritt (Saracens), J Joseph (London Irish), M Tuilagi (Leicester Tigers), B Twelvetrees (Gloucester Rugby); Fly-halves: F Burns (Gloucester Rugby), O Farrell (Saracens), T Flood (Leicester Tigers); Scrum-halves: D Care (Harlequins), L Dickson (Northampton Saints), B Youngs (Leicester Tigers).